Those of you who have known me for awhile know that I sponsor wolves at Wolf Haven in Washington state. Over the years, I have sponsored quite a few timber wolves and, sadly, lost them (mostly because I always sponsor the older wolves). My latest membership began with 4 wolves, 3 timber wolves and 1 red wolf...at the end of my membership year, I have only my red wolf, Rhett, alive. Today I called to renew my membership for Rhett and I added an adoption...not a wolf this time, but a coyote...a pup named Jimmy! In 1980, the red wolf was officially declared extinct in the wild. Loss of habitat, predator control, and hybridization with coyotes made it impossible for this species to survive without human intervention. The burden of reestablishing a wild population lay with only 14 captive red wolves. Today, roughly 100 red wolves roam wild in North Carolina. Each of these wolves is descended from those in the Red Wolf Species Survival Plan (SSP) captive-breeding program. Their numbers are slowly increasing despite many obstacles in their way. In captive-breeding programs, not all of the wolves bred for the survival of the species are released into the wild. Some remain in captivity to provide for future healthy genetic diversity. These captive animals need safe, comfortable homes, like that provided by Wolf Haven. Wolf Haven has been providing lifetime sanctuary for captive-born gray wolves since 1982. Our first red wolves -- a separate species from the gray wolf -- arrived on May 13, 2003. The addition of the red wolves has provided Wolf Haven the distinction of housing all types of wolves found in North America today: Gray wolves (Canis lupus), red wolves (Canis rufus), and Mexican gray wolves (Canis lupus baileyi) -- a distinct subspecies of the gray wolf. 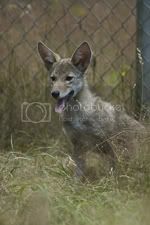 Red wolves are given an identification number at birth, which is recorded in an official studbook and allows for the tracking of all known red wolves. Wolf Haven's red wolves are numbered accordingly as Female (F) 515 and Male (M) 688, but were also given names by Wolf Haven staff upon their arrival: Rhett and Belle. Rhett was born at the Beardsley Zoo in Bridgeport, Connecticut, on April 20, 1994. One year later, he was transferred to the Great Plains Zoo in Sioux Falls, South Dakota. During that same year, in 1995, Rhett was transferred to the Racine Zoon in Wisconsin. 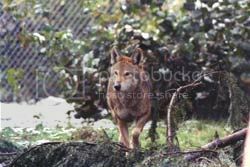 In 1999, Rhett came to Washington to reside at the red wolf program headquarters, Point Defiance Zoo of Tacoma. For the first few years of his stay at Point Defiance, Rhett shared an enclosure with his brother until the brother was transferred and replaced with his current companion, Belle. Rhett and Belle share a very special enclosure at Wolf Haven, constructed specifically for them by a local Boy Scouts of America troop with the help of Wolf Haven staff. Their arrival and acclimation was flawless, thanks to the expertise of Will Waddell, Point Defiance Zoo red wolf SSP Coordinator and Wolf Haven's outstanding team of Animal Care Specialists. Recognition should also be given to the wolves themselves, who immediately exited their transport crates and began confidently exploring their new home prior to settling down for an afternoon nap. Wolf Haven is not exclusively a sanctuary for wolves; we also have a handful of wolf-dog hybrids and a few coyotes. Jimmy is one of our newest coyote pups. While most of our animals come to us from captive situations, Jimmy and his surrogate “siblings,” Os and Carolsal came to us from the wild. All three had lost their mothers when they were very young, and while they were originally slated for rehabilitation and release, for various reasons none of them will be able to return to the wild. Jimmy came to us when he was approximately 12 weeks old. He was found inside a den in Bakersfield, CA. His mother had been shot and all but three of the other pups passed away from starvation. (It is believed that those three were later released back into the wild.) Crushed beneath the siblings that did not survive, Jimmy had lesions on his spine that resulted in both of his back legs being partially paralyzed. For one month he was given anabolic steroids to help build muscle which would allow him to move swiftly, though relying heavily on his two strong front legs. Little Jimmy is a very determined pup and seems to be coping with his disability well. Like most coyotes, particularly those that had at one time been slated for release, Jimmy is a bit leery of humans. He is getting more accustomed to animal care staff but still finds solace in the shelter when they approach the enclosure. It has been observed that he is usually the only one to hide there while Os and Carosal find security in hiding behind a bush or crouching low to the ground. It is possible that Jimmy has taken ownership of the shelter, but when night falls they seek each others comfort and the three sleep side by side. Rogue - My first wolf. His eyes never turned to the amber color of most wolves, but remained a beautiful blue. Tahoma - The pics of this old gal always made me smile : buff-colored and white, her body no longer lean but well fed...and her left ear bent forward at the middle. Onyx - Tahoma's mate. A black wolf that seemed to be howling in all of his pictures. Little John - Large and beautifully marked in brown, gray and white...he was people-friendly and a real favorite with the staff and on tours. Kiowa - Little John's mate. A long, lean and beautiful white wolf...she seemed always on the prowl (prob protecting her big, friendly mate). Marius - Colored like smoke...in shades of black, white and grey...his white face was surrounded by grey and he had a black shield-like patch right between his eyes...Marius always seemed alert and curious. Umm, did you just "pish"? LMAO! i see your "pish" and raise you one "posh".